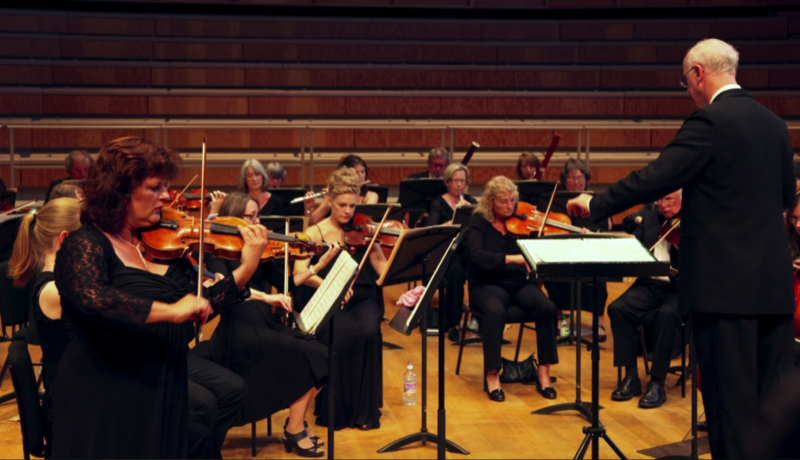 The Canterbury Orchestra ended 2015 in style with an uplifting programme of pieces by three great masters – Rossini (The Italian Girl in Algiers), Beethoven (Emperor Piano Concerto) and Schubert (Symphony No. 8 ‘The Unfinished’), all written in the first half of the nineteenth century. This well attended concert at the Colyer-Fergusson Hall clearly demonstrated why it is so important to support the wonderful local (and national) orchestras that we are lucky enough to have access to in the UK. Whimsical pizzicato strings opened The Italian Girl in Algiers, written by a young Rossini in 1813. The orchestra perfectly captured the ‘grandmother’s footsteps’ and motifs were moved adeptly around different sections, allowing the considerable talents of the oboe and clarinet to shine through the string textures. Rossini adds an element of surprise to his work, in the form of sudden tutti chords, which the orchestra handled with a sonorous, rich sound, but allowed every section to sing equally. Described by the conductor as having a ‘sunny’ mood (definitely represented by the ‘comic’ double basses’), this vibrant piece filled every space within Colyer-Fergusson (a considerable feat!). The first half concluded with Beethoven’s Emperor Piano Concerto (named so by the publisher so as to ‘cash in’ on the recent Napoleonic wars). The soloist was Chris Weston, a Cambridge and Royal College of Music graduate who approached the concerto with considerable style and flair. The first movement consisted of a confident orchestral tutti with the brass cutting through, but not overpowering the strings. The orchestra supported the soloist well, and allowed the virtuosic semiquaver passages to burst forward. The soloist achieved a wide array of tone colours from the piano and captured the essence of Beethoven’s contrasting moods especially within the powerful cadenza. The second movement began with a well-controlled piano from the strings and was followed by a well-defined but light 3/4. The woodwind section shone in this movement with exposed entries played confidently by all sections. The contrasting third movement opened in a sprightly 6/8 and was certainly a rousing finale, with expert playing by the soloist, who made Beethoven’s complicated writing seem effortless. The second half consisted of Schubert’s Unfinished Symphony, played in it’s ‘entirety’ (the third movement was a new, internet orchestration), although there is no record of why Schubert abandoned this work. The first movement’s long and unwinding theme was played emotively by the cellos and double basses and answered by a sinister passage from the violins and violas. A lyrical second subject in the viola and cello followed, later deftly played by unison violins. There was more exposure for the oboe which contrasted beautifully with the confident, yet controlled tutti sections. The second movement opened with a rich, almost pastoral sound, with confident interplay between the instruments of the string section. The audience was lulled by lyricism, only to be awoken by dramatic sections that disappeared as quickly as they entered. The third movement certainly demonstrated why composers (such as Beethoven) began to prefer the ‘violent’ scherzo to the more typical minuet. The strong opening was immediately contrasted by the well-played oboe solo and the whole woodwind section added an element of light-heartedness during their soli. Brief moments of counterpoint were contrasted with frequent solo opportunities and the orchestra demonstrated a full range of instrumental colours. The fourth movement ended the concert with a dramatic impulse, but was no less lyrical. A rich and fulfilling atmosphere was created which again was led by the oboe. The frequently changing mood did not phase the orchestra and all sections contained a real clarity of sound, allowing individuals to cut through when required. The piece concluded with a series of ‘false endings’ (that Haydn would have been proud of!) that kept the audience on their toes. A sense of musical wholeness permeated this concert and I am excited to see where this accomplished ensemble will go next.